Increasingly, people have been turning to non-surgical stem-cell treatments for hip injuries, hip arthritis, avascular necrosis, osteonecrosis, hip bursitis and other degenerative problems related to the hip joint. Adult stem cell therapy may help heal and alleviate hip problems with a same-day injection procedure by amplifying the concentration of a person’s own stem cells in the problem area, improving the body’s ability to heal itself naturally. Hip pain can be very difficult to deal with on a day-to-day basis and traditionally requires long-term pain management if the problem is not corrected. Hip surgery often the only medical option presented to a patient to deal with their debilitating pain. If you are considering a hip replacement, you might want to learn more about how stem cells stack up against hip replacements. Hip surgeries are typically very traumatic and are often followed by months of pain and discomfort while attempting to redevelop strength and mobility. Patients who undergo regenerative therapies usually walk the same day, and most require little recovery time. Bone marrow-derived autologous stem cell therapy offers an exciting option for relief from debilitating hip pain. 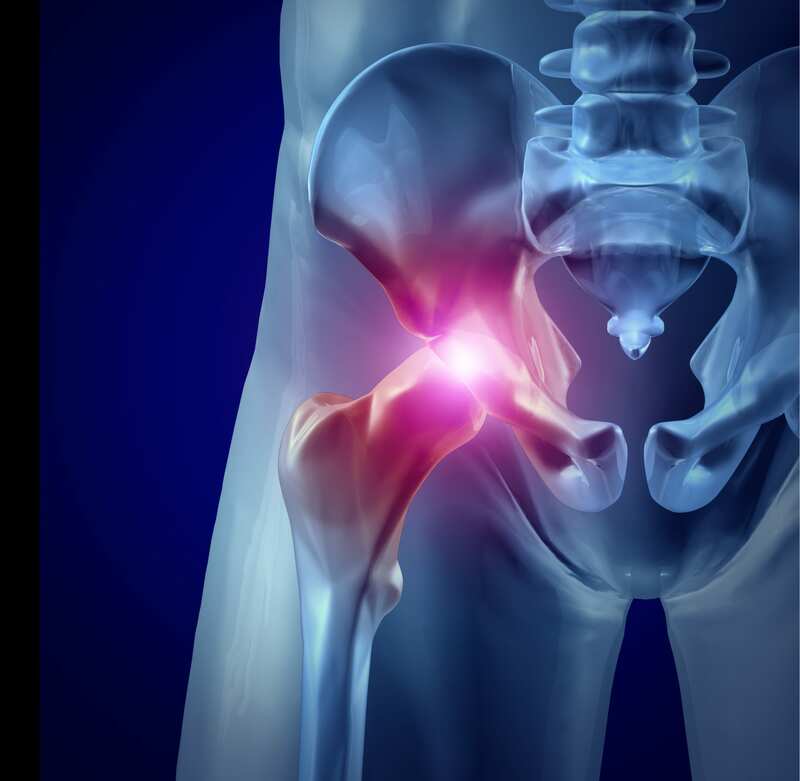 Osteoarthritis of the hip, a degenerative joint disease, occurs because the cartilage in the hip joint gradually wears away over time due to injury and inflammation. With no cartilage present to act as a cushion, the joint bones rub together upon movement causing pain. It is most commonly present in people who are 50 years of age or older, though it may occur in younger people as well. It is usually accompanied with pain, swelling, and deformity. Usually symptoms develop slowly and worsen over time. Most common symptoms include stiffness, a loss of flexibility, a grating sensation, and bone spurs around the affected joint (which is when the damaged bones start growing outwards to make up for the loss of cartilage). It has been observed that in some cases, the patient may still develop osteoarthritis, even without these conditions. One of the challenges is that diagnosis of the condition can be difficult since the pain associated with osteoarthritis of the hip can be found in different locations. Although in almost every case, the patient’s hip is stiff, patients can feel pain in their groin, thigh, buttocks, or knee. The degree of pain can vary from a sharp, stabbing pain to a dull ache. Stem cell therapy, a minimally invasive and less painful procedure, has been shown to be effective in reducing pain associated with osteoarthritis of the hip. Articular cartilage is found in the hip, between the femur and the hip socket, allowing the bones to smoothly glide over each other. Several factors contribute to wear and tear of the articular cartilage, including high impact sports, hip impingement and the natural aging process. Often, articular cartilage injuries occur in conjunction with other hip injuries. Common symptoms associated with an articular cartilage injury are joint soreness, redness, swelling around the joint coupled with pain that is typically worse upon movement of the joint. Overuse — Excessive use of a joint over a period of time with no time allowed for the body to heal. Degeneration — Osteoarthritis, a degenerative condition may cause injury or damage to the articular cartilage. An effective alternative could be regenerative medicine in which stem cells are harvested from the patient’s own body and are injected into the injury site. The patient will experience little-to-no down time with this approach. The labrum is the ring of cartilage that follows the outside rim of the joint socket in the hip. It acts like a gasket to help hold the ball at the top of the thighbone securely within the hip socket. Sometimes it can tear, due to structural abnormalities, repetitive motions, and traumatic injuries – most commonly in people who participate in football, hockey, soccer, and dancing. Although a labral tear doesn’t always show symptoms, some may feel stiffness or pain in the hip or a locking/catching sensation in the hip joint. However, some patients do experience pain in the hip and groin region, joint stiffness and a catching sensation. If left untreated, labral tears in the hip may eventually lead to osteoarthritis in the hip joints and therefore it is preferable to address the problem in the early stages. Trauma — Impact from an accident (work-related injury or contact sport) that results in damage or dislocation of the hip joint and eventually results in a hip labral tear. Repetitive Motion — Sudden twisting or pivoting motion that leads to wearing down of the joint and ultimately results in a hip labral tear. Birth Defect — Wear and tear of the joint that is accelerated in some people who are born with hip problems. Treating labral tears depends on the severity of the symptoms. It will usually begin with anti-inflammatory medication, followed by physical therapy and activity modification. At times, if conventional methods of treatment aren’t improving the symptoms, physicians will likely recommend arthroscopic surgery. A successful alternative could be stem cell therapy wherein the patient’s own stem cells are injected precisely at the area of injection to provide a healing and regenerative benefit.